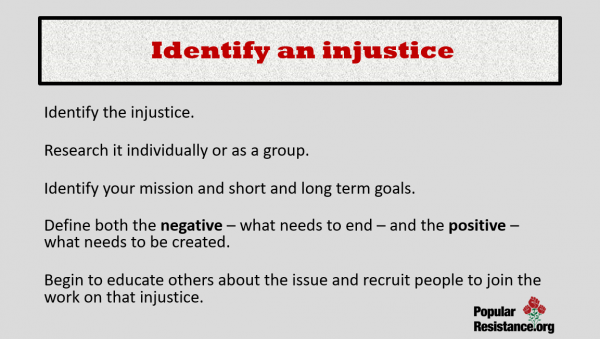 Form a core group: Identify people committed to improving conditions or ending an injustice. Build on common self-interests. Build unity as you grow. Seek diverse backgrounds, experiences and skills. 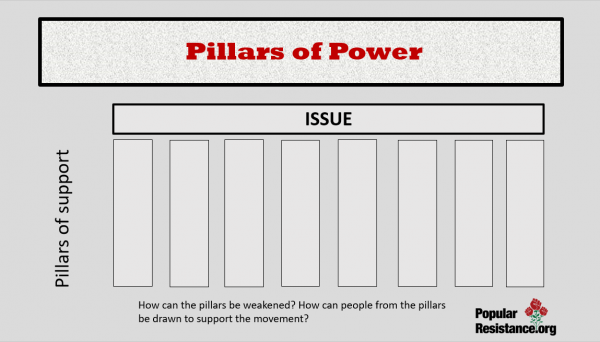 Identify an issue: Come together around an issue, identify and define the issue. 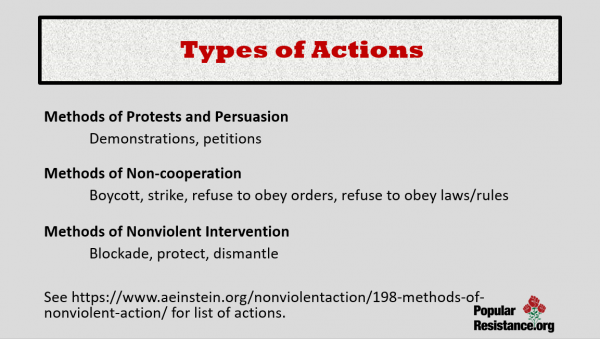 Advocate for a positive solution as well as a negative (something that needs to stop), i.e. stop the machine, create a new world. 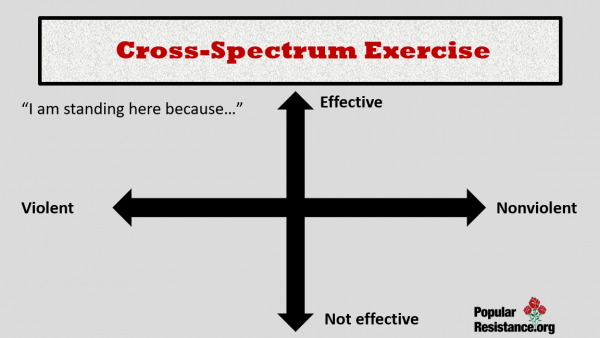 Frame issues so people will agree with you and will ask questions to understand more. Education is the first step to building a movement. 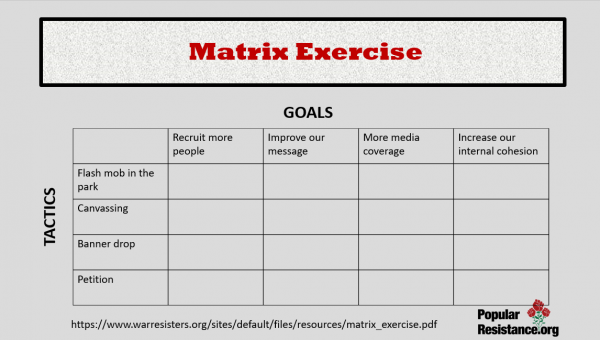 Identify a mission and goals: Develop long-term and short-term goals that define purpose and mission. 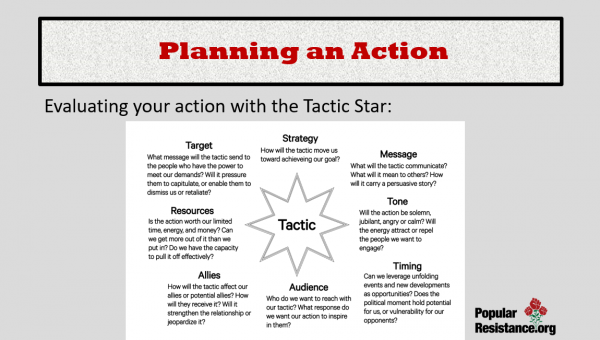 Create a narrative for your campaign. 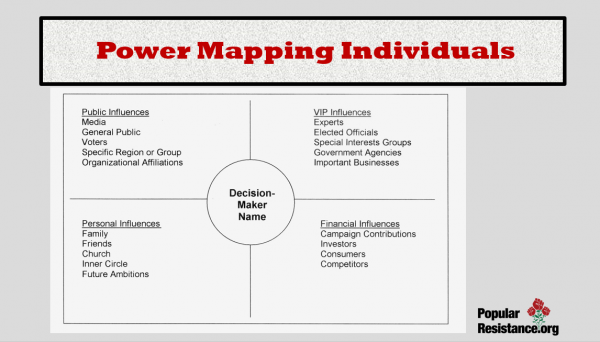 Build out from core group: Like a circle with your core group in the center, build outward with concentric circles based on people’s ability to participate, skills, interests. Build people-power to achieve the goal. 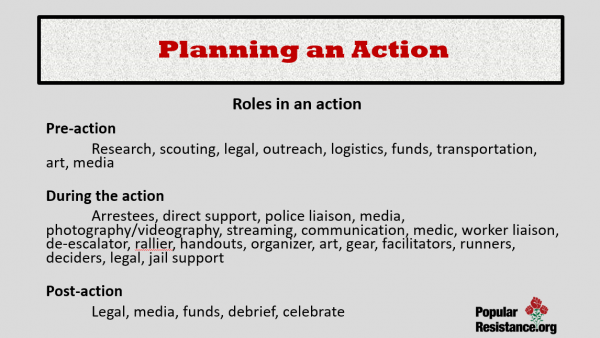 Recruiting: Getting people involved should be ongoing with each action having recruiting people as a goal, e.g. forums, tabling, petitions, flyering, surveying, canvassing. Recruit people directly impacted by the issue. 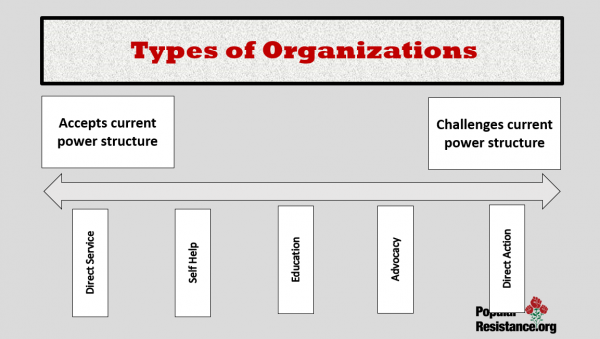 Let people know what you need, give them a menu of tasks that are needed. 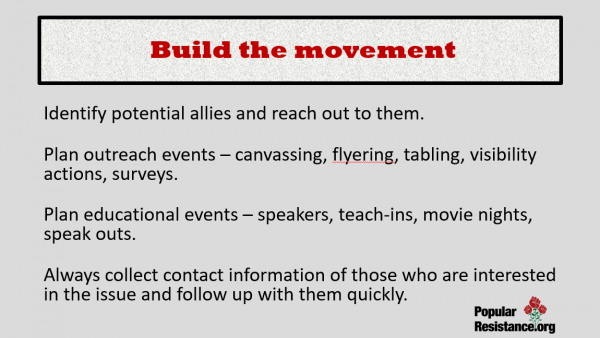 Gather contact information (phone, email) and get in contact quickly, thank people for attending events, engage them. 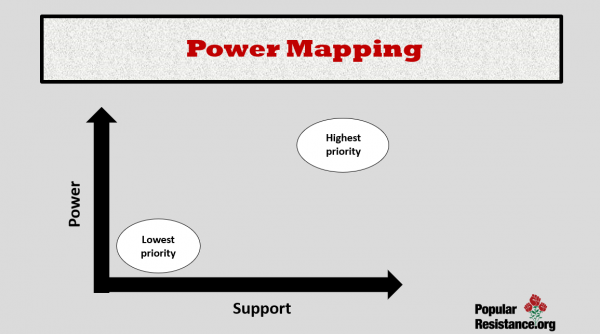 Support new leaders especially from impacted groups. Find out who will volunteer, i.e. make phone calls, organize others. 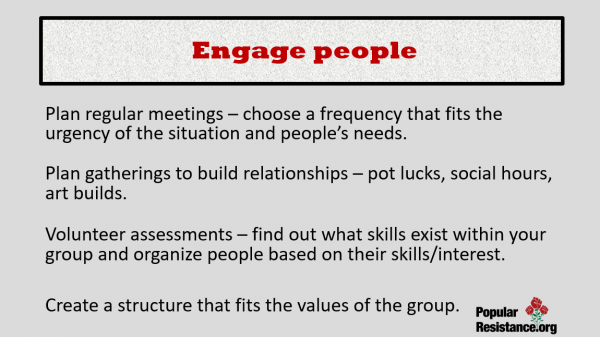 Engage people: Hold regular meetings or conference calls, welcome new people, act more and talk less, work in pairs, limit time commitment, hold social activities, conduct skill-building, art-making events, make it fun. Contact or call new people within a week, find out their interests, concerns, and recontact them regularly. 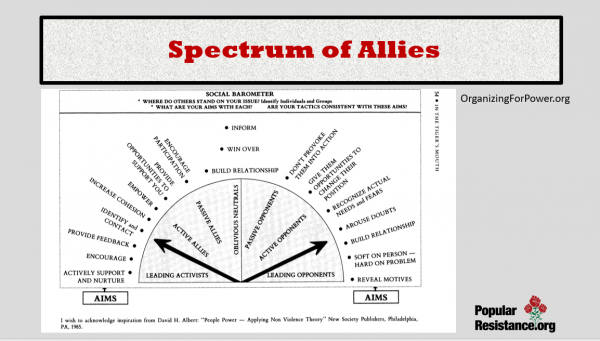 Identify allies: Identify individuals and organizations that share your goal and involve them. 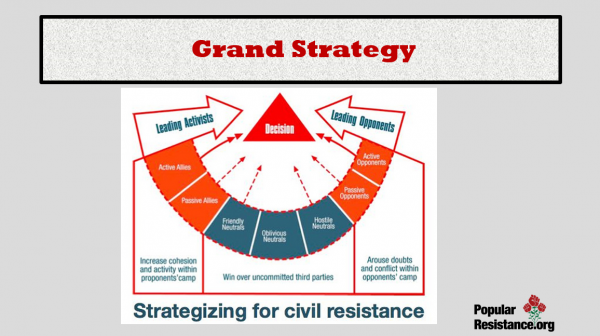 Identify opposition: How do you move them to supporters, neutralize them, limit their influence, divide them? 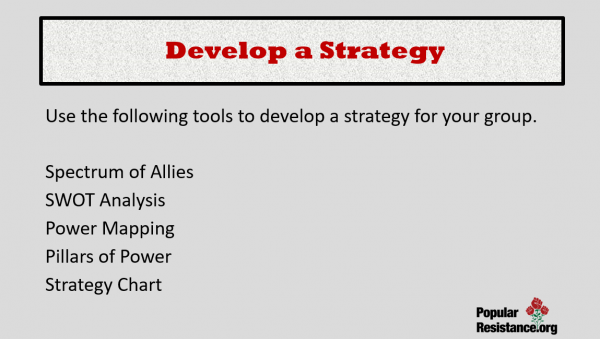 Develop a strategy and plan: Strategy comes from your goal, what steps do you need to get there. 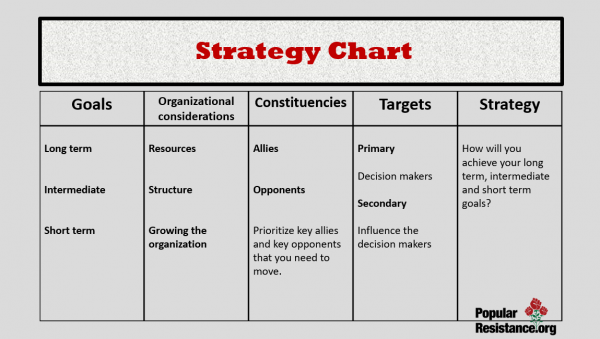 Tactics serve the strategy and make-up a general plan to support strategy. 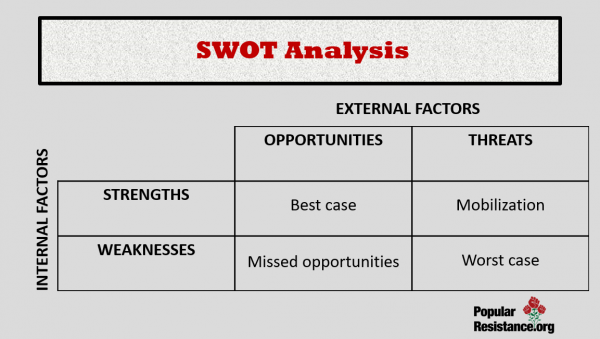 Identify tactics that will achieve your short, medium and long term goals e.g. demonstrations, events, contacting elected representatives, website, social media. Develop a Timeline: Working backward from the end of the campaign examine each stage toward your goal, imagine the moment before victory and what needs to be in place. 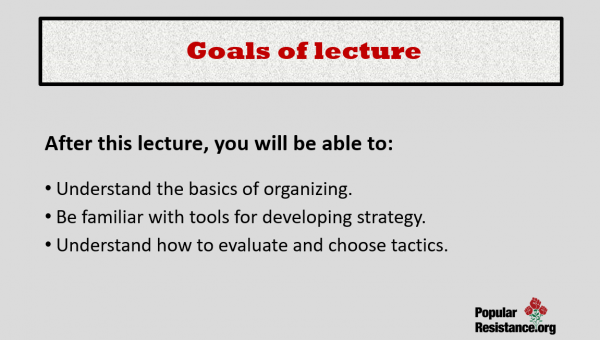 Develop specific activities: Set goals for very specific actions, e.g. contacts with government representatives, public events, phone call campaign, media events. Simple is better than complex. Evaluate: Learn from success and failure. Debrief after events. 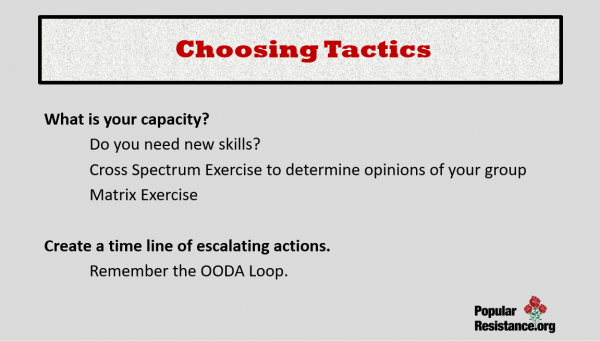 Evaluate strategy, tactics and activities to improve them. Celebrate wins: There will be many steps to your overall goal and wins along the way. Small victories should be celebrated, both internal organizational goals as well as external policy changes.